Garden writer and photographer Karen Bussolini profiled Larry Weaner in a feature article for American Gardener, published by the American Horticultural Society. Karen has frequently photographed LWLA projects and writes knowledgeably about Larry’s work. 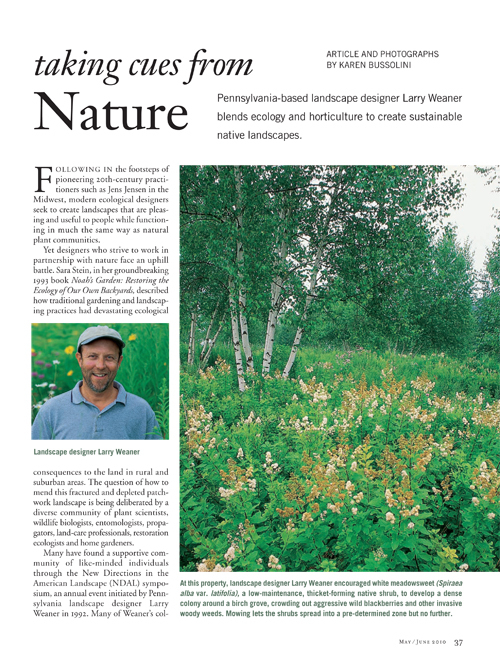 In her article, she quotes Darrel Morrison, noted landscape architect, on Larry’s significance to the field: “’Larry Weaner’s work as a designer and as an educator, through the conferences he has supported, place him in a unique group of people who have raised the awareness of the fact it is possible to create, restore, and manage landscapes that are at the same time ecologically sound and experientially rich. … His approach, while centered in the Northeast, has implications for landscape design in a much broader geographic area'” (p. 38). American Gardener (May/June 2010), p. 37.